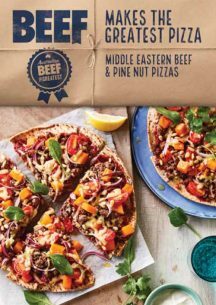 Use our delicous, premium Harvey Beef Mince in this recipe. Click here to find your nearest stockist. Preheat oven to 200°C (180° fan-forced). Line 2 large baking trays with baking paper. Heat oil in a large non-stick frying pan over medium-high heat. Cook mince for 3 to 4 minutes or until browned. Add garlic and spices and cook for a further minute or until fragrant. Meanwhile, microwave pumpkin on HIGH (100%) for 2 to 3 minutes or until just tender. Drain. Place one Lebanese bread on each of the prepared baking trays.Divide the pizza sauce between breads, top with mince mixture and sprinkle with onion, tomatoes, cheese and pine nuts. Cook in oven for 10 to 12 minutes or until bread is crisp and cheese melted. 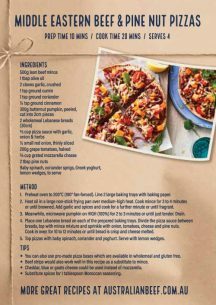 You can also use pre-made pizza bases which are available in wholemeal and gluten free. Beef strips would also work well in this recipe as a substitute to mince. Cheddar, blue or goats cheese could be used instead of mozzarella. Substitute spices for 1 tablespoon Moroccan seasoning.